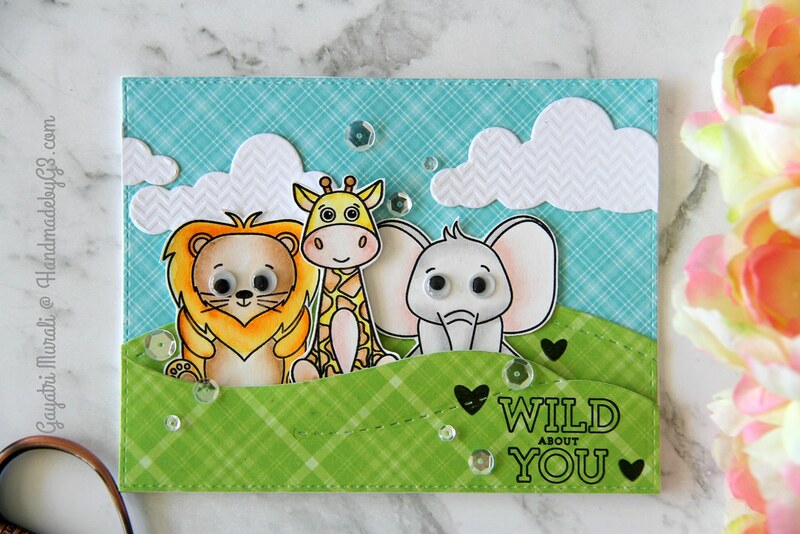 Simon Says Stamp new card kit for this month called Wild and Colourful arrived yesterday. As the name suggests the kit is full of colourful pattern papers, cardstocks and inks. The stamp set is absolutely adorable. Although the kit is sold out, you can buy all the card kit items separately from Simon Says Stamp store. I stamped all the images from the stamp set twice on Bristol smooth cardstock and watercolour them with Zig Clean Colour Brush pens. Then I cut them all using scissors. Today, I set out to make some cards. I will share one today. I have used the blue plaid Lawn Fawn pattern paper from the kit as the sky and the green plaid pattern paper for the landscape. I used stitched rectangle die to die cut both pattern papers. 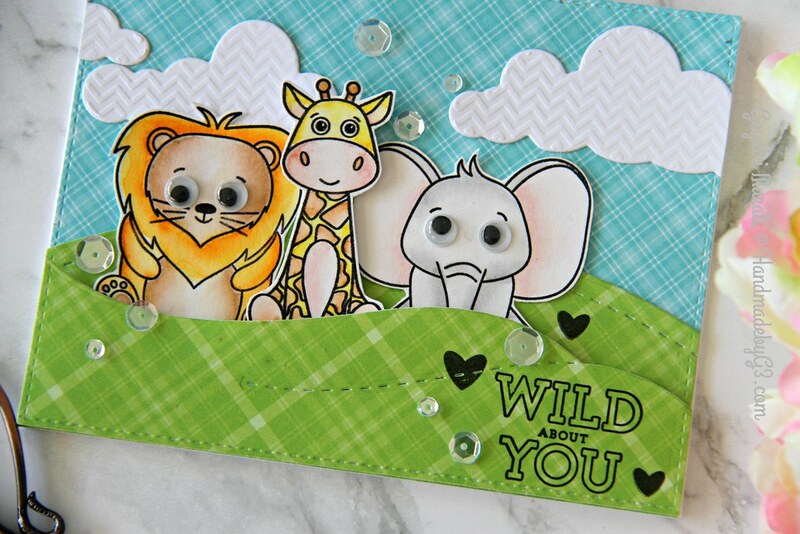 The green stitched rectangle panel is then die cut twice using Simon Says Stamp Stitched Slopes and Hills die. I adhered one of the slopes and hill die cut flush to the blue stitched rectangle panel. The other using foam adhesive. The clouds are die cut using Simon Says Stamp Chevron Clouds dies and white cardstock. Love the chevron texture on the clouds. I stamped the sentiment from the stamp set in the kit using MISTI and Versafine Onyx Black ink. Then scattered stamped the solid hearts as well. 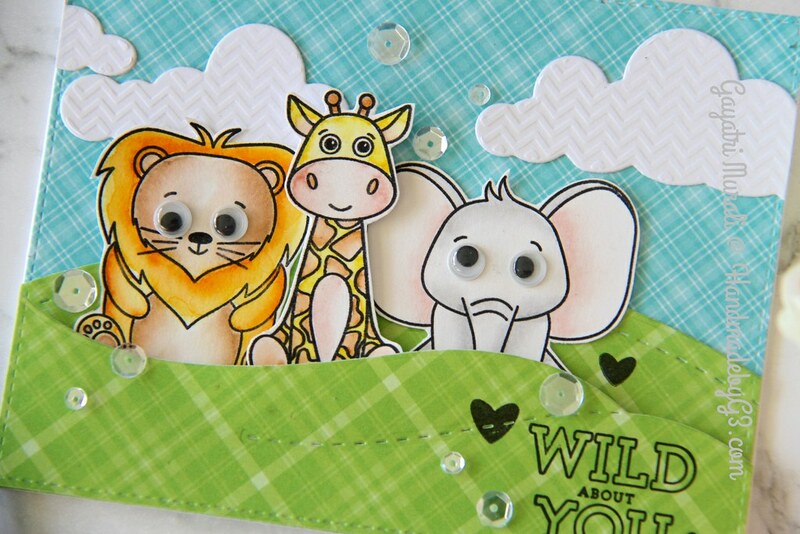 for the focal point, I chose the lion, elephant and giraffe. I adhered the lion and elephant flush and the giraffe using foam adhesives. Finally embellished with Sparkly Clear sequins. The finished panel is adhered to the car base. Oh thats so pretty Gayatri, especially those googly eyes, too cute! I pinned them for future reference. Thanks for sharing!